Roger Clemens, six years into his "twilight" (defined by Webster as a period of decline following glory or success), shuts down Arizona. Cold night freezes bats as pitching and defense win in October once again. RedSox.com news-to-you: Manny Ramirez wins Silver Slugger award. Anderson has window of opportunity to close door on New York tonight. Arizona only 54 outs from first world championship while the Red Sox seem light-years away. Will Rocket shut it down if Yankees fall behind? Is Pedro (last seen heckling Kerrigan then hiding in the Dominican) the problem? More exasperating than Everett? Will McDonough says Martinez won't be a team player. Will Petey come in with a healthy... attitude? He may be getting in shape... but is he working out? New kid in town Arizona jumps on top of the World Series. For Old Towne Team, it remains a dog-eat-dog world. But Yankees future cloudy in the Valley of the Sun. This forecast calls for Arizona to reign in six. You got a problem in Houston? Jimy Williams is the frontrunner for the Astros job. His mission: to control the press. Will his homespun "humor" find a home here? Well, if a frog had wings he wouldn't bump his booty, again. Back to the Mediocre Future for Bruins. Way Back to the future. Werner feels lucky with Lucchino. Les Rotten wants a role for Duke. Will Tom thumb Dan? (yes) Lucchino will win, hands down. Mariners Get Deep-Sixed. No Game 6. Sorry Lou. Same old Sele as New York slews Seattle, leaves them sleepless like Choakland. Yankees get 38th pennant, go back to the series that the Red Sox haven't won for 83 years. They're the same guy in The World According to Duke. Rising Arizona is just Randy, World Serious. Werner bid in the ballpark. Tom puts the pieces together. O'Donnell/Karp group puzzled. Is Duke the missing piece, or hopefully just missing? Good news? Tom Werner, a dyed-in-the-wool Sox fan, should own the Olde Towne Team in a few weeks. Oops!... Dan did it Again. Answers only lead to more questions as Duquette does the biggest DanDance yet in his latest radio appearance. He remains in denial, these interviews are pointless, Mike Wallace wouldn't get anything out of him. Is Tom Werner's Group Less Rotten? Financial plans from the Red Sox bidders are due today. If the Werner/Otten group wins the Duke would stay. Dan is doing another live radio speech with the Team of A. And with Down out as hitting coach, let's bring back Bill Buckner... will it happen? Just replay the tape... because they'll never be another Butch from the Cape. The cantankerous callmaster of sports radio has finally been silenced. Yanks provide final answer to A's. Trump Oakland in five. Regis and The Donald get close up look at A-Dogs collapse. Yankee Elimination Party cancelled like the Emmys. Mo Vaughn Scores points with Red Sox Nation in New York City on Saturday night. He wants to take another lap and dance around the bases at Fenway next year. And he doesn't care who is running the team, Disingenuous Dan included. Run Jeremy! A's to Zito can't get it done. A loss of Red-Soxian proportions. Yankee Elimination Party postponed. Brave old world as Houston has same old problem. It's deja vu all over again as Atlanta wins another October series. Here's hoping the A-Dogs smell blood today. 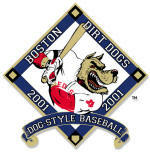 The gritty A-Dogs (Adopted Dirt Dogs) grind it out in New York. Yankees hit the road but that's about it. A's must play it like they're down 0-2... that's the ticket. BTW, it's OK to like the Oakland A's and love America too. And Johnny-comes-on-lately-Damon could be our new Dirt Dog come April. "...hoping to catch some Morgan Magic" and "Red Auerbach said if you're right..."
Just two of the stilted references that Duquette uses on every stop of his world media tour, a.k.a., Duke's Love Boat. The more cryptic non-answers his PR firm provides, the more questions there are. But no one follows-up or asks Mr. Accessible to provide any specifics. They just kiss his ring and keep tossing softballs... like Roger did last night. Kind of like firing the janitors at Massport... how 'bout that Curt Schilling? Just another one that got away. Here's hoping the most Dirt-Dog-like team can handle New York. The Yankees have bought enough World Series championships in past five years. Season of Malcontent Mercifully Over. 2001: A Sox Oddity ends on a high note. 2002: The Year of the Dogs begins today. Will Jason, Pedro, Nomar, and Manny be healed? Can John-not-gone, Duke, and Joe hang on?!? Is Cone (nice job), Nomo, or Urbina coming back? Will Mo head home? Will they spend $30 million just to show some frauds the door? Time will tell. Spring training is only 131 days away. months ago. And now Trot runs away with it. Bonds, the anti-Bourque, finally gets #70. Bourque, finally revered, gets #77 retired. Oh, and Sox win again. Will they ruin Cal-the-Bourque-of-baseball's last home stand? Have we found the third starter for next year? Looking for something positive to latch onto besides Trot. Sox only 16 1/2 behind Yankees. Only one game under .500! The good. The sad. And the ugly. The good: Only five games left in this horrific season. The sad: Helen Robinson, Red Sox receptionist for 60 years, passed away today. We extend our deepest sympathies. The ugly: Sox tank it in Tampa again. Drop to 6-23 in their last 29 games. Nixon winning race for captain according to latest poll. He already won the primary at Boston Dirt Dogs. Kerrigan leans towards endorsement. Nomar and Jason may also be on the ticket. Trot steps up, speaks out against the frauds who shut down. No need to name names, we all know who they are. And hopefully they won't be back. (Note: Like the gap in Nixon's (Richard not Trot) tapes, the December 1st - January 5th headlines are missing. I deleted them by mistake).